Jerry Robinson is an accomplished artist, writer, historian and curator. He is President and Editorial Director of CartoonArts International and Cartoonists & Writers Syndicate (CWS), affiliated with New York Times Features Service, which syndicates and exhibits the work of 350 leading cartoonists and graphic artists from fifty countries. He negotiated the first regular use of foreign cartoons in the Russian and Chinese language press. While a journalism student at Columbia University, Robinson began his cartooning career at age seventeen on the original Batman comic book in 1939 for which he created the Joker, comics’ first supervillain. He named Batman’s protégé, Robin, and designed his costume. He now serves as Creative Consultant to DC Comics. Among Robinson’s thirty published works is The Comics: An Illustrated History of Comic Strip Art (Putnam), acclaimed as the definitive study of the genre. His other books include the biography, Skippy and Percy Crosby (Holt), and The 1970s: Best Political Cartoons of the Decade (McGraw Hill). Three new books have been released in 2010: a two-volume set of his 1950s sci-fi strip, Jet Scott (Dark Horse) and a biography, Jerry Robinson: Ambassador of Comics (Abrams). In spring 2011, Dark Horse will publish a 400-page updated edition of The Comics. Robinson has served as President of both the Association of American Editorial Cartoonists (AAEC) and the National Cartoonists Society (NCS), the only person so honored by his peers. He has traveled to over forty countries on behalf of CWS, serving on international art juries as well as on several tours of Europe, North Africa, Japan and Korea entertaining servicemen. 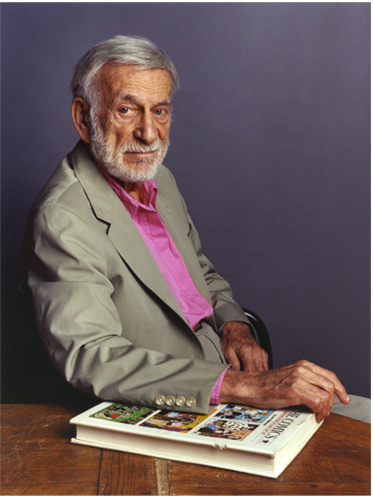 His award-winning features of social/political satire, Still Life and Life With Robinson, were internationally syndicated daily for thirty-two years. Robinson‘s drawings appeared monthly in the Broadway theatre magazine Playbill. He is the co-art director of the hour-long animation, Stereotypes, filmed at the Soyuzmult Studios in Moscow, and co-author of the musical Astra: A Comic Book Opera which made its debut in Washington, DC in 2006. A graphic novel adaptation of Astra was published in Japan and the U.S.
Robinson has served as curator for numerous exhibitions in the U.S. and abroad. They include the first show of American comic art at a major fine art gallery, the Graham Gallery in New York (1972). He served as special consultant for the largest exhibition of the cartoon at The Kennedy Center, Washington, DC, and for the landmark show at the Whitney Museum, New York. Exhibitions abroad include the first of American cartoon art in Tokyo, Warsaw, and Moscow; and others in China, Portugal, Slovenia and Ukraine. At the invitation of the United Nations, Robinson produced major exhibitions in Rio de Janeiro (Earth Summit, 1992), Vienna (Human Rights, 1993) co-sponsored by the Austrian Government, Cairo (Population & Development, 1994) and New York (Sketching Human Rights, 2007). In 2004 he produced the first in-depth exhibition of the genre, The Superhero: The Golden Age of Comic Books 1939 –1950 at the Breman Museum, Atlanta, which is now on tour. In 2006, Robinson curated the exhibition, The Superhero: Good and Evil in American Comics, at the Jewish Museum in New York. Robinson has led creator rights cases including copyright, trademark, censorship, First Amendment and human rights. Examples include: representing Joe Shuster and Jerry Siegel, creators of Superman, in their struggle to obtain financial security and restore their creator credits; obtaining the release of jailed and tortured cartoonists in Uruguay and the Soviet Union; writing briefs on behalf of the AAEC and NCS, one in trademark litigation brought against editorial cartoonists and the other presented before a U.S. Senate committee on postal laws; and serving on the joint arts committee that negotiated creator protection in the copyright renewal law. For eighteen years Robinson was on the faculty of the School of Visual Arts, The New School and Parsons School of Design, all in New York City. An exhibition of his color photography from seven countries was held at the SVA Galleries. In 2000 Scriptorium Films produced a ninety-minute television documentary on Robinson’s career for Brazilian TV.